After congratulating myself for throwing off a cold, I woke up on Saturday morning without a voice - cold back with a vengeance. My father-in-law (who probably gave me the cold), also has a bad cold, which meant that S couldn't take the kids to the in-laws. Apparently he caught his cold from an out of date cheesecake. Don't ask. Both of these combined meant I couldn't take advantage of the free pass I'd been given by S to go out and enjoy myself. So my day of treats, including some shopping, tea and cakes in Great Titchfield Street's Scandikitchen and cocktails in Bob Bob Ricard was cancelled. This meant there was little to take my mind of the fact I'd just sold my beloved car- a pepper white and black Mini Copper, which went by the name of Pig (a prize for anyone who works out why). I desperately wanted to keep it, but it just wasn't practical - we don't need two cars, and Pig simply isn't big enough to cope with 2 car seats and Adam's pushchair, let alone any luggage or shopping we might have. So was feeling very miserable. So, I made what I usually make when I want something comforting with least amount of effort: a big pot of spicy, cold-combatting dahl. I've never actually followed a recipe before. Instead, I make a vague approximation of what my mother-in-law does instinctively - lazily, I usually just select a load of whole spices (clove, cardamon, cumin & coriander seed, cinnamon bark, bay, black pepper), some ground spices (turmeric, cayenne) throw them into some oil, along with some chopped onion, garlic and ginger, then add water, lentils, and either one or other of tomatoes/coconut milk - sometimes both. Sometimes I'll add some diced lamb at the beginning. I'll always cook in a pressure cooker - 10 minutes on high for the meat, before adding the lentils. If I'm just cooking lentils, the whole thing is done in 5 minutes. So you can see - minimal effort and really tasty. But the point of this blog is to try actual recipes, so I thought I'd better put a dahl recipe to the test for the first time - I have loads of them. 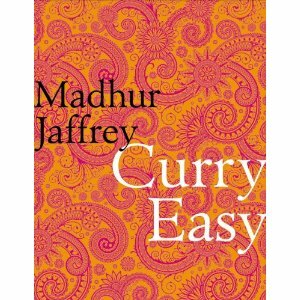 I'm not sure how many Indian cookery books I have, but they would fill a long shelf. As I was (am) feeling delicate, I thought a simple one would be best, so I went for one of several options in Maddhur Jaffrey's Curry Easy, Red Lentils with Ginger. It was the most pared down I could find - onions, garlic, ginger fried in oil with ground coriander, cumin, cayenne and turmeric, then cooked with tomatoes and red lentils, with fresh coriander leaf and some butter stirred in at the end. It was nice, but unfortunately, nowhere near as good as the one I usually make. I have lots of dahl recipes to try (another 7 recipes in this book alone), so I'm going to keep a tally but so far, it's Me 1: Cookbooks 0.